By Miriam Rasch, March 15, 2019 at 11:03 am . 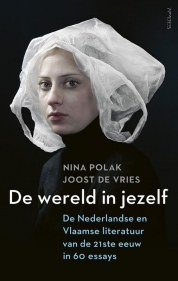 Written for and presented at the launch of The world in yourself: Dutch and Flemish literature of the 21st century in sixty essays, 7 February 2019, Spui25 Amsterdam. After receiving a tip about translation website DeepL, I decided to experiment with it. I must say I’m impressed with the results (except for the word ‘tangconstructies’ that apparently does not exist in English, which is something to be happy about). The following text has been edited, but not substantially. Scroll down for the original Dutch version. I would like to start by laying out a few fragments, ‘lapidaria’ from the past few months that seem to be somehow connected with each other. Connected in an essayistic way, I hope. Whether that also says something interesting about the essay will have to become clear later on. In January I attended a conference in Berlin. As is still possible in Germany, the Germans spoke German and all other people spoke English. At the entrance of the conference hall you could pick up a pair of headphones in exchange for a photo ID to follow the simultaneous interpretation. Although my German is far from good, I did not use the service. Listening to a simultaneous translation is simply annoying; since the speakers are about ten metres away and the headphones are far from soundproof you can hear them through the audio. But I also dare say that I grasped what was said, which might mean something different from saying that I understood. ‘How come it’s so easy to follow a German presentation and almost impossible to read a German article?,’ I asked a Berlin acquaintance. He needn’t think long. ‘Everyone thinks they should write like Adorno.’ He was referring (I think) to those typical German ‘tangconstructions’ as they’re called in Dutch, you know, sentences with clauses that even a German doesn’t just churn out during a talk for a large audience. Whether the speakers were explicitly instructed not to read out but rather tell their story to the audience, I don’t know, but that’s what they did. They were involved with us, headphones or not. Recently I was reminded of Adorno and writing, but in a completely different way. The Adorno of the essay, who was against ideological sending, for whom the essay had neither ‘a first principle, nor a last’ (pdf). The essay as a collection of lapidaria, fragments, never completely finished, always containing open ends, resisting dogmas in its very form. But apparently, if I understood my acquaintance correctly (who by the way had studied in Frankfurt, home to Adorno and the Frankfurter Schule), Adorno himself had become a dogma, a model that only yielded mediocre and unnecessarily complicated texts. How to escape sending, transmitting a point as evident Truth, with a self-evidence that conceals the relativity of Truth? And how to escape without immediately falling into incomprehensibility or ‘tangconstructions’, whether figurative or other? The question often forces itself upon me in a specific place: the classroom. During the break of one of my classes I overheard my students talk about a fellow teacher of the programme in which I teach, which is called ‘Philosophy in a post-digital world’. Apparently I visibly pricked up my ears, because one of the students looked at me and said: ‘Yes, Miss, he’s just one of those teachers that you talk about at home over dinner (most students still live at home). He starts talking and a few hours later the lecture suddenly is over!’ I instantly believe that my colleague is a compelling orator. Still, it did nag me. I guess I’m not the teacher you talk about at the dinner table. On the other hand I was happy, because what I strive for in my lessons is not to orate but to cause confusion. Sure, knowledge transfer is important (a point that is not so obvious in education anymore) – but for me confusion is part of knowledge. Without confusion, no philosophy. So there is something else at stake: it’s not just that there is no first principle, nor a rounding off in a last one. There’s also no first person who stands up and tells their story and after that collects their papers and leaves again. Something is already going on. Something confusing, crumbling, informal, and collective. Another lapidarium has to do with something that I probably should have reported right at the start, but about which I am a bit reluctant: maybe (maybe, maybe) this also has to do with the fatigue that I notice – in myself! – with regard to the genre of ‘I’. Yes, I know it, I say I all the time. That’s part of the problem, who never tires of themselves? So let me stick to myself: I am tired of my self. Of my essay-I. The I can act as doubtingly as it wants, but it still enters, stands up, tells their story and then disappears again. It’s like this, I’ve been reading (too) much about posthumanism as well (not to be confused with transhumanism). The posthumanist shifts (or writes) themselves out of the centre of importance. Not straight out of life, not back into the state of silence abandoned with so much pain (Fred Moten and Stefano Harney come from Black Studies and wouldn’t opt for that any more than a woman would). We’re not talking about erasing experience, the re-murder of an already dead author. She’s still alive, but marginal. Better yet: operating from the margin, because she’s not condemned but convinced. Busy with others, with something else than themselves in any case. If we want to change the world – to dismantle dogmas, loosen structures (and I truly hope everyone wants that) – that starts with such a ‘post-individualism’, so to speak. As you shift yourself out of the centre, into the periphery, at the same time something else shifts into the frame. Gary Hall calls this ‘the inhuman’ (pdf). (By the way: the inhuman, as in inhumane, should as a word just be stripped of its moral charge, as by now it must be clear that human is very good at things that are considered degrading to people and the world.) The world cannot change by just talking about change – changing the way we talk (write) is equally important. Strangely enough, says Gary Hall, critics now do their work in a way that would seem familiar even to scholars from the seventeenth century: ‘Rational, liberal, humanist authors working alone in a study…’ It is time, he says, to shake up the given, the dogma, of that humanist author. As a final to my course the students have to write an essay, and by this I don’t mean the limp academic concoction of that. As that assignment is confusing enough, I give them the advice (not the obligation) to match the beginning and end of the essay. The circular form may be a cliché for experienced writers, but that does not do it justice. The circle also echoes the carrier bag, as Ursula Le Guin called it. The story as a shopping net in which you collect all kinds of different seeds and fruits, perhaps also a special stone or two. You carry it with you and let others share in it. That carrier bag is not yours alone, it is not about you. Everyone who opens it and takes out the collected stuff will put it in a different order, give it a different value. Le Guin addressed fiction with the carrier bag, but I think it could also be a representation of the essay. A different kind of essay. In literary journal De Gids, Thijs Lijster wrote about the essay: ‘The ‘I’ of the essayist is … the testing instrument, the seismograph that perceives shocks deep in the earth’s crust that may not be perceptible to everyone.’ It is meant metaphorically, but the planetary imagery fits wonderfully well with the posthumanist, inhuman, ‘call of pigeons’. Shocks deep in the earth’s crust, which indicate something new. The essay has always been a loosely tied gathering place of different voices, stories, perspectives. But there too, rigidity is possible, as poor Adorno himself has found out and as I am afraid to find out with my own ‘I’. Just like Lijster, I return to Montaigne with love and pleasure, but mostly I am interested in what news awaits us, what arises, what emerges from the murmur and fuss in the background and under the surface, what we will make, from the not yet finished, the premature, the collective. I’m curious, what’s going on? On 15-16-17 May the conference Urgent Publishing will take place, at which this and other lapidaria will be explored further under the title ‘The Carrier Bag Theory of Non-Fiction’. Please come and join the discussion! Op 15-16-17 mei vindt de conferentie Urgent Publishing plaats, waarbij onder de noemer ‘The Carrier Bag Theory of Non-Fiction’ deze en andere brokstukken verder zullen worden geëxploreerd. Kom ook en praat mee!